Bring your own device (BYOD) policies, once considered a radical departure for healthcare IT departments, is now a common part of an overall clinical communication strategy. Many hospitals are adopting BYOD programs to save money by shifting device costs to clincal and medical staff. But it creates challenges around managing highly sensitive patient data on devices outside of the organizations ownership. 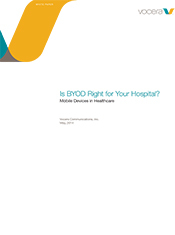 There is no one-size-fits-all approach to BYOD, but there are some basic questions and concerns that hospital executives must consider. Get this valuable report to get answers to key questions about the use of personal devices in the clinical hospital setting. For more information about Vocera solutions to support your institution's BYOD strategy, click to complete the form or call 888-9VOCERA to get in touch with a Vocera sales representative.